Welcome to the latest post from the Science Geek. I hope you have enjoyed my previous posts about the Moon. This time I will be writing about the origin of the word eureka which dates from ancient Greece and is an fascinating early example of applied science. An exclamation used to show that you have been successful in something you were trying to do. Your will recall from my post on 12 May (“The Acid Test”) that gold has the property of being extremely resistant to corrosion by air, water and even concentrated nitric acid. It is extremely malleable, which means that it can be made into a very thin sheet (gold leaf), and ductile, which means that it can be be stretched into a thin wire. These properties, coupled with its beautiful colour and its rarity, have made gold an extremely valuable commodity in virtually all cultures, throughout recorded history. The current price of gold in July 2014 is around $45 000 per kilo (www.gold.org). This compares to around $700 per kilo for silver. Indeed, because of its high value, it is often given as a token of love. Like many men, I had to entice Mrs Geek to marry me by buying her a gold engagement ring, followed by a gold wedding ring, and a gold eternity ring. I also wear a gold wedding ring. Another property of gold in that it is one of the densest known metals. Density is defined as mass divided by volume and the table below shows how much a sphere one litre in volume would weigh in kilogrammes for various pure metals. 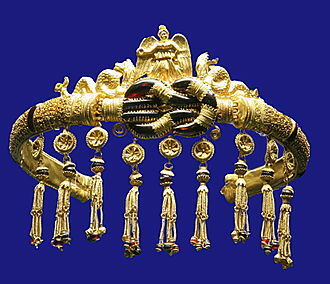 According to legend, the Greek king Hiero of Syracruse, who was king from 270 BCE until his death in 215 BCE, had given some gold bars to a goldsmith and told him to use them to make a decorative crown to go into a temple. When the crown was presented to the king it appeared to be made out gold and weighed the same as the amount of gold that he’d given the goldsmith. However, the king did not trust the goldsmith and suspected that he may have made the crown partially out of a cheaper metal and coated it in gold leaf. He needed some way to determine whether the crown was made out of pure gold. 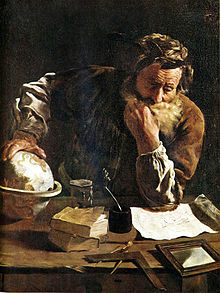 He gave the task to Archimedes, who was one of the greatest scientists, mathematicians and inventors in the ancient world. Archimedes considered the problem and to him it was clear that a crown made of pure gold would have a smaller volume than a crown made of cheaper metal, even they weighed exactly the same. This is because gold was the densest known metal at that time (see note below), so if a cheaper metal had been substituted for gold then the crown would be less dense and need to be bigger in order to be the same weight. At that time, determining the weight of an object was no problem, but finding out the volume of an irregular-shaped object was more problematic. Archimedes needed therefore to find a way of measuring the volume of the crown so that he could then compare it with the volume of an equivalent weight of pure gold. He would then know whether a cheaper metal had been substituted. But how could he determine the volume of an irregular shaped object like the crown? 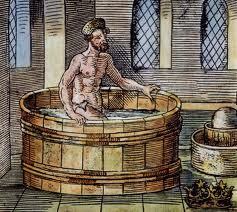 According to the story, the solution came to Archimedes when he stepped into the bath tub. He noticed that the water rose higher and higher as he put more and more of his body underwater. He then realised that the amount by which the water level rose must be equal to the volume of an object submerged. At this point he exclaimed “Eureka” which is ancient Greek for “I have found it”. According to some versions of the legend he ran naked through the street of Syraruse shouting ‘eureka’ in sheer delight. When the crown was submerged in water it was found that the water level rose more than an equivalent weight of pure gold. So the goldsmith had indeed tried to cheat the king, for which he was executed. No one knows, but it’s a great story. As the legend only emerged around 200 years after Archimedes’ death, I suspect that at the very least it had been embellished over the years, but in any case it is an interesting early example of applied science. I hope you have enjoyed reading this. My next post will be on space tourism. When will ordinary people venture into space ? This is a subject which has always fascinated me since I read Arthur C Clarke books as a child. Until the discovery of platinum in 1752, gold was the densest known metal. Today, other than a few artificially created heavy elements which are all radioactive, there are only four stable elements denser than gold: platinum, osmium, iridium and rhenium. all of which are very rare.